Musical.ly is a popular app among teenagers This is a lip-sync short video creation app where users can record themselves singing their favorite music track or dubbing a dialogue.Now the app has been acquired by a Chinese media company Bytedance. Even if the company has confirmed its plans to keep Musical.ly running as it was, but we can never be so sure. So, you need to know the alternatives to try in case you want similar kind of app to try after Musical.ly. There could be more reasons to find the alternatives to Musical.ly app. So, In this article, I am listing the best Musical.ly alternatives. You can use this list to find out a new interesting app to try. Flipagram is one of the best alternatives to Musical.ly. It allows users make “Flips” that includes the mashup of videos, photos, text and 30-second snippets or sons. It has good editing tools for creating videos from photos, creating photo video collage and create a slideshow. The company also keeps on updating this list with interesting latest tracks. There is a large music library for using it in videos. Funimate is also a similar app that offers Musical.ly app like experience. You can record yourself lip-sync to some of the most popular music tracks. You can record yourself, edit videos, add cool effects and share. The app is easy to use. So, editing videos is a real fun. If you want to record lip-sync videos, slow-motion videos with interesting effects and music, you should also try this app. Cheez is another similar app that lets users record and edit short videos. The app allows you to easily edit, trim, cut, merge and duplicate video clips. You also have live filters to use in videos. You can also add music from the large music library. Lip-sync option is also there. There is also an option for daily battles, challenges, and dance off. So create your videos and challenger others and show your talents. Tik Tok is also a nice app for recording and sharing short videos. This app is similar to Musical.ly and has a strong video platform. The app is simple to use. Just record short clips, apply effects & music and share. There is also a massive music library to use. So, install the app and take your creativity to next level. Dubsmash is a popular app for creating dubs of popular songs and movies dialogue. The app became trending a few months back when India Youths started sharing their Dubsmash on different social media websites. The app has a large collection of short audio clips for creating lip-sync videos. It shows videos in the form of Snapchat-style Stories. You can also add stickers and text to decorate videos. We have listed 5 best alternatives to Musical.ly app. You can use any of these apps to create short videos, lip-sync videos and more. All these apps come with a huge collection of hit songs for creating interesting videos and share with friends. Now musicians are also using these apps to promote their music among Youths. Musical.ly is still the most popular in this segment, but other alternatives are also not bad. You can also use these Musical.ly alternatives. 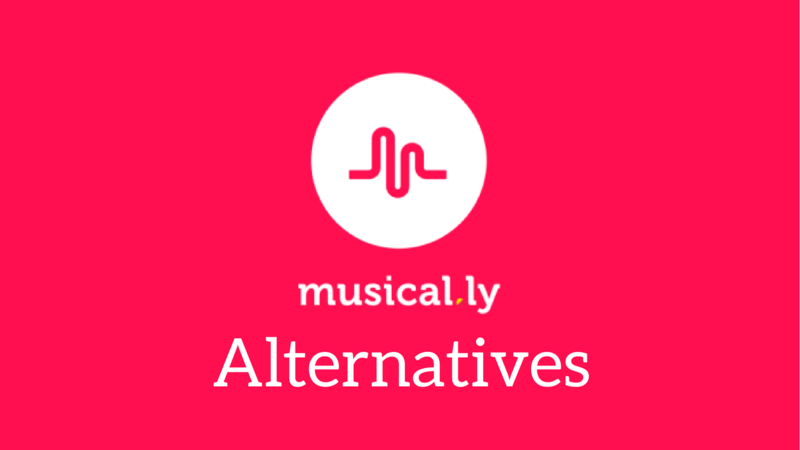 If you know any other interesting Musical.ly alternate, you can share it with us in comments.